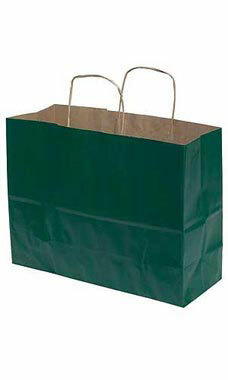 Your customers will love taking their purchases home in these stylish Hunter Green Paper Shopping Bags. Add tissue paper, ribbon, or raffia, and you can easily transform ordinary shopping bags into colorful gift bags. Constructed from tear-resistant paper and featuring twisted rope handles, these durable bags will make it convenient for customers to tote home their purchased items. Sold in cases of 25.